When construction was first started in 1887, it was called "useless and monstrous" as well as a "ghastly dream." Yet this structure has become one of the most beloved icons of a major city and a wonder of the age of steam. This most French of all buildings was actually inspired by an artifice from the New World. In the early 1880's, Maurice Koechlin and �mile Nouguier, two engineers working at the design firm of Gustave Eiffel, were thinking about what the centerpiece of the proposed 1889 World's Fair in Paris should look like. They had heard about a tower in New York City called the Latting Observatory that had been built as part of the 1853 Exhibition of the Industry of All Nations. The Latting Observatory, a wooden octagon-shaped structure, at 290 feet high had been the tallest building in New York for the three years it had existed until it burned down. Visitors could climb its heights and get an unobstructed view of the city from its observation platform. Koechlin and Nouguier brought their idea to Eiffel, who authorized further study. While the Latting engineers had paid little attention to the look of their tower, the French engineers considered the form and beauty of the structure to be a paramount consideration. Koechlin drew a sketch of it which he described as "a great pylon, consisting of four lattice girders standing apart at the base and coming together at the top, joined together by metal trusses at regular intervals." Other members of Eiffel's company added the idea of decorative arches to the base of the tower and a glass pavilion at the first level. Minister for trade, �douard Lockroy, supported Eiffel's proposition and altered the rules of the design competition for the fair's centerpiece to favor the tower. In June of 1886, it was selected as the winner. -Height: 984 feet (300m). With modern antenna 1,063 feet (324 meters). -Construction: January 1887 - March 1889. -Made of: 7,300 tons of wrought iron. Total weight: 10,000 tons. -Maintenance: 50 to 60 tons of paint are required to coat the tower every seven years. -Other: Second highest structure in France after the Millau Viaduct. The Latting Observatory in New York. Despite their protests, construction commenced on January 28th, 1887. 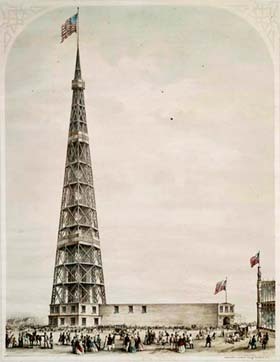 While some critics didn't like shape of the tower, others were concerned that it could not be finished by the opening of the fair, or that it would be impossible to build at all. It would be, after all, the tallest building in the world when finished with a height of 986 feet (300m). The previous record holder, the Washington Monument, was only about half the height of Eiffel's proposed tower. What's more, the Washington Monument was a traditional masonry structure (made of brick or stone), while Eiffel's structure would be made of wrought iron, a huge departure from previously known and trusted methods of construction of such tall edifices. 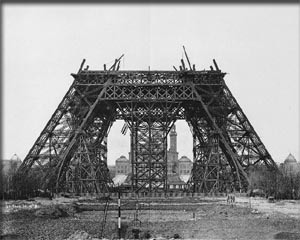 Eiffel's team, however, were experienced bridge builders, and since the tower construction used many similar materials and techniques, they were certain of their ability to finish the erection in time. The architectural firm created 1,700 general drawings of the tower and 3,629 detailed drawings of the 18,038 different parts that needed to be built. All parts were created at a factory in the Paris suburbs and brought to the site via horse-drawn wagons where they were bolted together. Nothing was created on location at all and if a part didn't fit, it was sent back to the factory to be altered. The first thing that had to be done to build, before the first iron section of the tower arrived, however, was to pour four massive concrete foundations, one to support each of the tower's huge legs. The support for the east and south legs, farthest from the River Seine, went in relatively easy. They were 7 feet thick (2m) and well supported by firm ground. The west and north foundations, however, were near the river on softer, wetter ground. Here it was necessary to build two compressed-air caissons that went down to a depth of 72 feet (33m) to keep the water out as the ground was excavated and the concrete poured. On top of each slab of concrete a huge block of limestone was installed. These limestone blocks, cut at an angle at the top, provided a place for the tower's metal feet to rest. The first level under construction in March of 1888. By the end of 1887, construction of the four metal legs of the tower was well underway. Gigantic hydraulic jacks, capable of pushing with the force of 800 tons, were installed at each of the bases, allowing the legs to be pushed into position so they would join at precisely the right way at the first platform 189 feet (58m) above the ground. As the construction continued, the lifting of new parts into place on the tower was done by four small cranes, one installed on each leg. As the tower grew, the cranes were designed to "creep" up the legs so they would always be in a position to lift new parts into place. The first level was finished by March of 1888 and the second level - 379 feet (116m) - just a few months later in August. The tower was completed in March of the following year when the flagpole was installed 984 feet (300m) above the ground. Visitors could go as high as the observation deck at the top level of the tower which was 906 feet (276m) above the ground. Today, the top of the tower (with a modern radio antenna installed) is at 1,063 feet (324 meters). Though many doubted Eiffel's ability to complete the tower on time (one tabloid newspaper headline had reported "Gustave Eiffel Has Gone Mad: He Has Been Confined in an Asylum" during a temporary halt in construction), the erection of the tower went smoothly and only required 300 workers at the site. Amazingly, due to Eiffel's careful use of equipment like guardrails and screens, only one man was killed during the undertaking, an incredible safety record for a big 19th century project. The tower in its original function as a gateway to the 1889 World's Fair in Paris. Though many visitors chose to climb the stairs up the legs to the first and even second levels, it was clear that elevators would be needed to handle much of the fair traffic. Elevators were installed in two of the legs to carry visitors from the ground to the first level. These were relatively simple in design because despite traveling at an angle, the tracks they rolled on were straight. More complicated were the pair of elevators that took visitors from the first to the second level as the curve in the tower legs at this point made the use of straight tracks impossible. The problems were so significant that no French firm wanted to take on the project. The commission overseeing the tower had to abandon their requirement of only using French contractors and go to the American firm, Otis, to get the job done. For the final leg of the journey up the tower, a pair of elevators worked together to get visitors from the second to the third level. Passengers were required to change cabs at a halfway point. When the tower was competed, it weighed approximately 10,000 tons. Of that, 7,300 tons were composed of wrought iron. There are 328 steps to the first level of the tower and 669 from the base to the second level. There is a staircase to the top level which involves an additional 996 steps, but tourists are only allowed to access the first and second levels by stairs. An elevator must be used for the trip to the top. At the very top of the structure, Gustave Eiffel maintained an office for many years where he received guests and did meteorological observations. The office is still viewable by visitors and contains a mannequin of Mr. Eiffel. 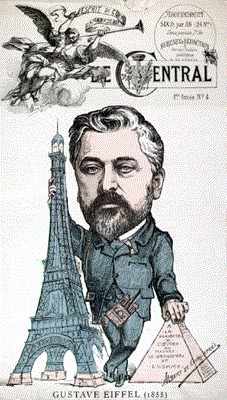 A caricature of Gustave Eiffel drawn on the occasion of him comparing his tower to the Pyramids. 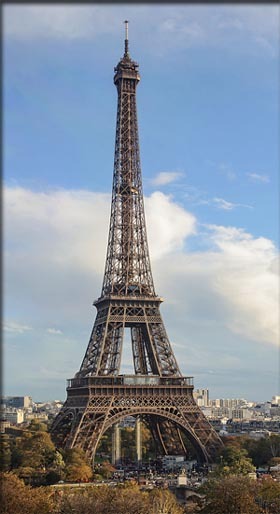 For such a large structure built in the 19th century, the Eiffel Tower deals very well with the wind. Eiffel himself commented "Now to what phenomenon did I give primary concern in designing the Tower? It was wind resistance." Even in the strongest winds, the tower only sways 2 to 3 inches (6-7cm), remarkably little for such a tall edifice. The tower was only supposed to be in operation for 20 years. 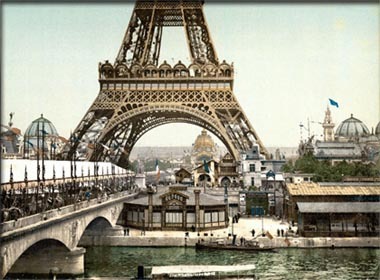 After that, the ownership was to revert to the city of Paris which had plans to disassemble it in 1909. However, it proved so useful for communications, it was allowed to remain standing. Eventually it became such a well-known icon of the city, no Parisian today would ever consider taking it down. During World War II when the Germans occupied the city, Hitler ordered that the tower, along with many other historic buildings in the city, be blown up if his army was forced to abandon the area. Fortunately, General Dietrich von Choltitz, the military governor of Paris, disobeyed Hitler's orders and the historic monument was preserved. So the tower remains in position even today, an iconic symbol of a world-class city.